The Germans probably have a word for it. But in English the closest I can get is “the feeling you have when someone speaks your heart far better than you can”. And its sad addition “and the feeling you have when they die”. Terry Pratchett’s death (or should I say Death?) was long in coming – Alzheimer’s is a cruel and truly terrible thing. Many of you know Sir Pratchett’s writing, and some of you the man himself. And while I could single out Small Gods as my favorite of his works, I was never sorry I read even one book of his. That I associate him with Stephen Colbert may seem bizarre, but I do. I well remember watching Colbert’s Press Club evisceration of George W. Bush, and that exact moment when he went all in – the look in his eyes that told me he hated the mendacious suckfish of the U.S. media as much as the policies of the killers they were failing to report accurately about. And not only that he got it, and was taking a rare moment to speak truth to power, but that he was simply better at all of it than I was. There are many reasons of course, but I cannot shake the idea that it’s because the real Colbert so adeptly used the character of “Stephen Colbert, right wing press hack” as a mask. The way Pratchett used all the hackneyed tropes of fantasy and fiction to tell true stories about all the things that matter. 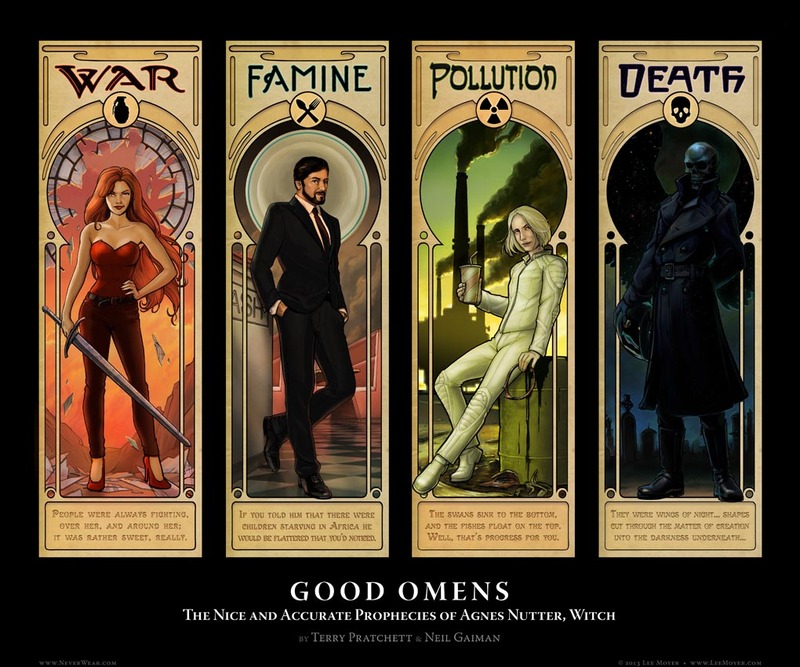 I’d heard tell of Discworld for several years, but we’d never really “met” before I read Good Omens, his collaboration with the esteemed Neil Gaiman. 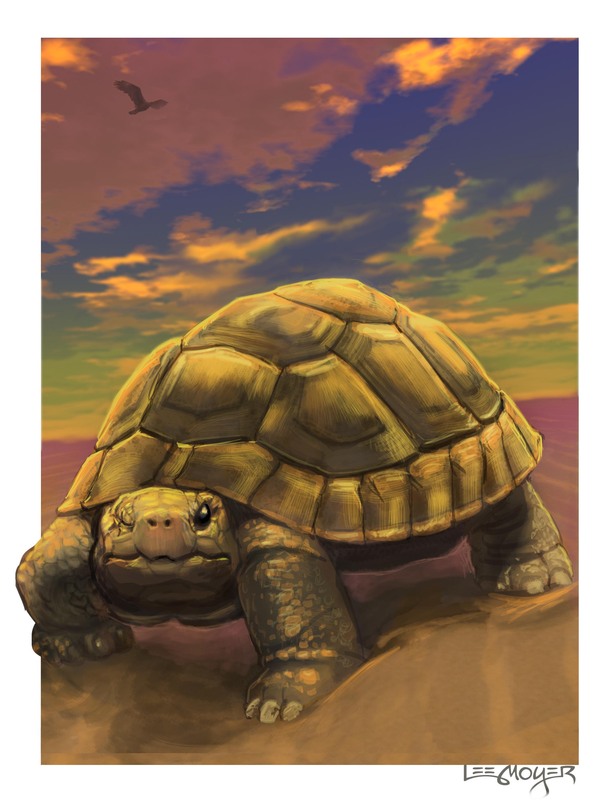 But once begun, Pratchett’s oeuvre proved hard to put down, and after a couple decades of reading, I was asked to be the artist guest of honor at The North American Discworld Convention. By then I was ready. But the sad truth of Pratchett’s Alzheimers diagnosis had just been revealed, and Pratchett stayed home. Rather than have a few drinks with the legions of adoring friends, fans, and families, Pratchett sent a high-tech “hello” from across the briny and the likes of Bernard Pearson to keep things lively. (Trying to match wits with Bernard was a highlight of not just that convention, but the entire year). 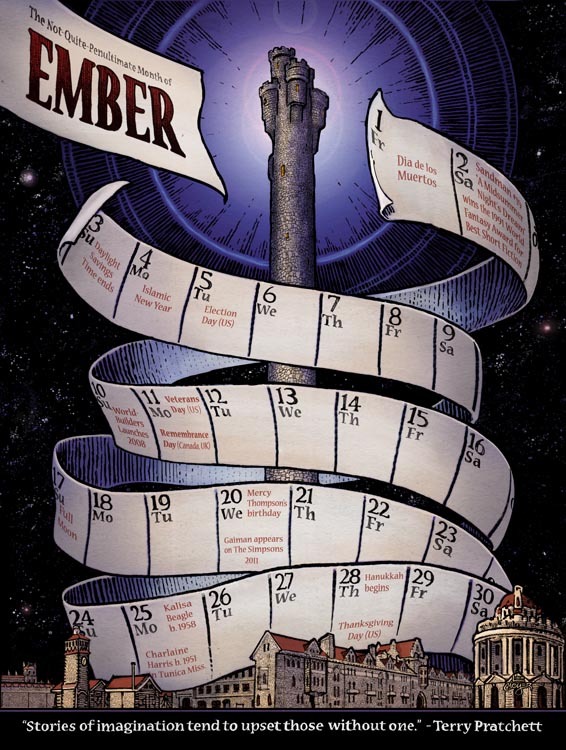 Pratchett’s Calendar spread shows the not-quite-penultimate one we call ‘November’ but the denizens of Discworld, in their 13 month cycle, call ‘Ember’. The 8 day week proved problematic, but the double helix makes so many things possible. Nothing was off limits to Pratchett – everything could be questioned, altered and enjoyed. Death is everywhere in Pratchett’s books (Gaiman’s too, come to that), but some things transcend it – art and love among them. He left his all on the page. A reformed Om’s blessings to him for that. Pratchett never got to see these pieces – all from ‘Good Omens’ (and including my favorite joke in the entire book: “Admittedly he was listening to a ‘Best of Queen‘ tape, but no conclusions should be drawn from this because all tapes left in a car for more than about a fortnight metamorphose into ‘Best of Queen’ albums”). I hope you’ll enjoy them. Added bonus! The pin-up that goes with the calendar page above. 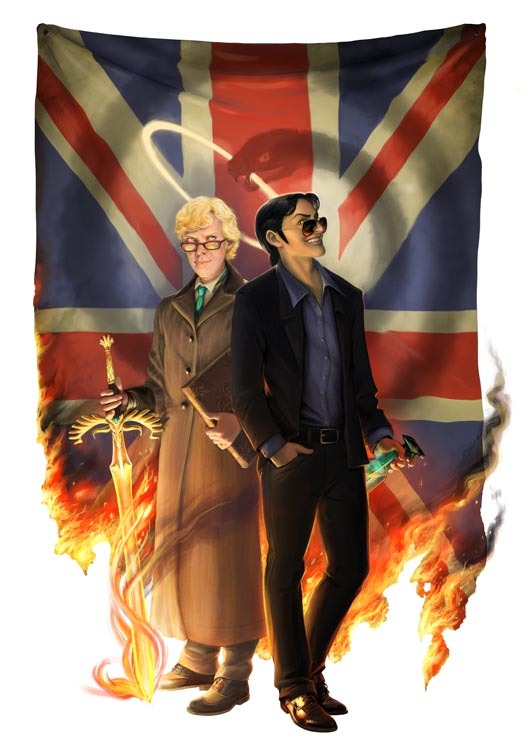 This entry was posted in Uncategorized and tagged Best of Queens, Death, Discworld, Good Omens, Neil Gaiman, Om, Sir Terry Pratchett, Small Gods, Stephen Colbert, Terry Pratchett by leemoyer. Bookmark the permalink.